Dublin, Ireland is a cosmopolitan city that draws millions of tourists. The city has something that makes people want to visit, time after time. Maybe the pubs and Irish music or maybe Dublin’s past, present or future? Or is it the Liffey and the waterways with Georgian houses and Dublin doors? I spent a week in Dublin and walked a whole lot each day. That gave me the idea to plan a self-guided walking tour that shows you the best of Dublin – in one day or in a week, what you prefer. You walk along the banks of the Liffey were most Dublin sights are, and along the Grand Canal to Dublin’s Georgian streets and see the coloured doors of Dublin. Dublin is an ideal city to walk around. It’s not a big city. Dublin’s population is only half a million so the centre is small enough to stroll through and there’s not much traffic. Walking is the best way to explore Dublin though there are hop on hop off and other Dublin tours as well. Dublin has a small centre but the whole metropolitan area has almost 2 million people which is a third of Ireland’s population. Ireland has 5 million people. It could be more, 10 million people have left the country over the centuries. That makes there are 17 million people with an Irish background spread around the world. So in a way Dublin is the capital of a big nationality. This is a map of Dublin city centre with the river Liffey running through it. The red marker points at Temple Bar where my self-guided walking tour starts. We first walk south of the Liffey and return north along the Grand Canal that is in west. North of the Liffey we walk west along the quays and cross the famous Ha’penny Bridge back to Temple Bar. Then we will still visit Dublin Castle and Christ Church Cathedral in the city’s old part. Of course it’s not mandatory to start at Temple Bar. You can start wherever you like or walk in the opposite direction. This walk has no rules. Zoom in the map to see more details or zoom it out to see Dublin in another scale. 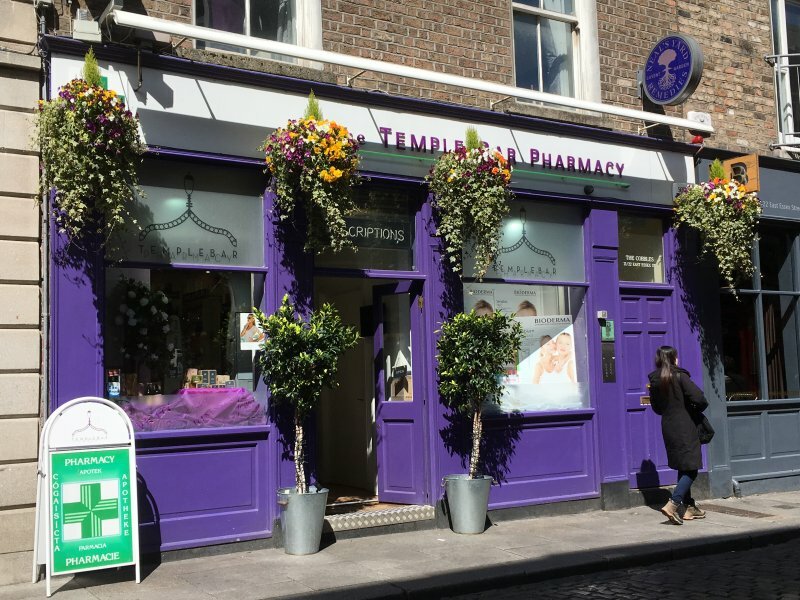 Temple Bar is the heart of the city that most tourist want to see first and that’s why the self-guided Dublin walking tour starts there too. What Temple Bar is famous for are the pubs. There are pubs in every street corner and more pubs in between so you can’t visit every pub. Most of them are traditional Irish pubs and look very old. Temple Bar is one of the oldest areas in Dublin and it dates back to Viking times. Over centuries craftsmen and merchants moved to these narrow quarters that got their name from Sir William Temple who owned the land. Walking up and down these cobbled streets you will hear Irish music drift from pubs. Mostly exactly the kind of Irish music you recognize, the kind of music people all over the world love. The Irish that left abroad packed Irish music in their suitcases. Look inside the pubs and sit down for a while and listen, but not too long. This is a self-guided Dublin Walking Tour and we have to go on. You can come back and you sure want to! 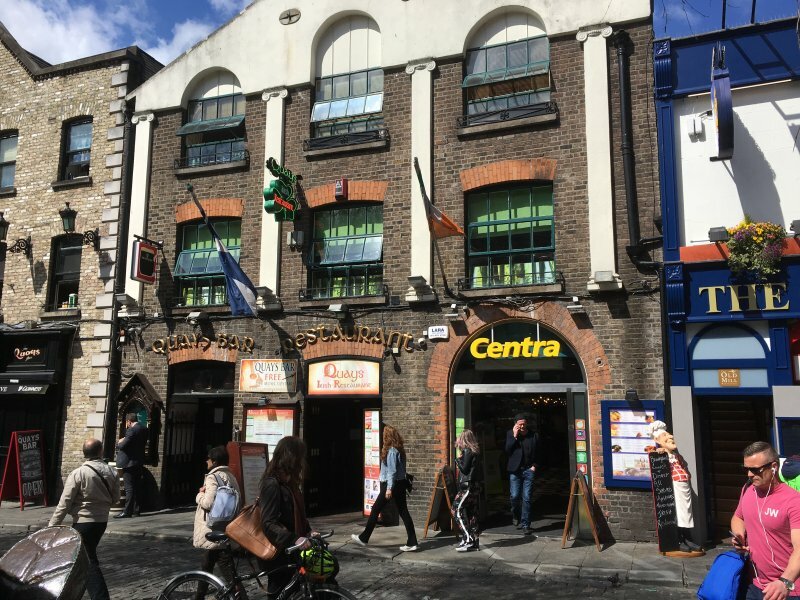 But Temple Bar has more than the pubs, it’s a large entertainment area with theatre, art exhibitions, galleries and so on. And all venues look like pubs, or what do you say about this one?It’s a pharmacy. This pub fills the narrow gateway that leads to Ha’penny Bridge. We will come back to that well known bridge later. As we are in Ireland there are Irish pubs all over the city, not just in Temple Bar. We found great pubs east of St Stephen’s Green (this Dublin walking tour will bring you there too) and those pubs were not touristic at all. In Temple Bar most pub guests are tourists. This pub is next to Trinity College that is what we will see next. Trinity College is a world-famous university and highly respected. The college was built before year 1600 and for hundreds of years, until the 1970’s, they only let protestants in to study. The Trinity College courtyard has green lawns for students to sit, an old clock tower and many beautiful old buildings – and a huge tree to give shade. The tree is like a well planned monument. Even if you are not a student you are free to walk on Trinity College grounds. But to get to the library you will need a ticket. Trinity College Library has a huge 64 metres long room with 200 000 old books and there are more books in other rooms. This is Ireland’s biggest book collection. All books are not Irish and a part of them came from the Dutch prime minister’s book collection. Trinity College Library also has Ireland’s oldest harp and the Irish national script, the Book of Kells. The Book of Kells is a book in four parts that has the four gospels written down in Latin. Monks in other parts of Ireland did the job over 1000 years ago and the book finally came to Dublin in 1653. These photos show the Book of Kells, but I can’t show you the original. I only have photos on Book of Kells souvenirs from the bookstore. It was not allowed to take any photos on the real one. But you can see the writing: the monks wrote in Latin but used Celtic letters. They decorated the each chapter with large initial letters that had many colours. And to end the lines they used decoration as well. Book of Kells also has beautiful picture pages that include a lot of symbols. The exhibition explains that all. Sooner of later you will want to leave the dusty library. Take Grafton Street south. Grafton Street is Dublin’s most important shopping street and leads to St Stephen’s Park that has a lot of flowers and a pond. There is another park too, Merrion Square that has beautiful Georgian houses around it. In general this area has a lot of old Georgian houses that have colourful doors, doors of Dublin. The residential area south of Temple Bar and Trinity College was built in the Georgian time in the 1700’s and 1800’s. Dublin was one of the most important cities in the British Empire, second only to London and Dublin needed to grow. Wealthy families built their houses south of the Liffey and they built them all in the Georgian style. The rules said that all houses have to look the same. That’s what they really do. But the families didn’t like it that way and made the doors individual. The result was that each door in a house has a different colour. You can see coloured Dublin doors around Merrion Square and Fitzwilliam Square south of it and on Baggot Street between them. And there are more doors around the Grand Canal. And Georgian houses all have some great details like iron gates and apartments below ground level. I loved walking around and snapping photos on these Georgian houses and we even stayed in one. We rented an apartment and our Georgian Dublin door was black. The area south of the Liffey is an interesting place for tourists. There are a lot of Irish pubs that have live music and some great museums. There is the Irish National Gallery, Natural History Museum, the Irish National Museum – Archaelogy, the National Library and a museum called Science Gallery. The museums I went to happened to be free so it was easy to drop in and have a look. You can do that on rainy days, probably you will have them during your Dublin stay. Dublin weather is hard to predict, or you can predict that it’s going to change in a minute. The photos are from the National Museum – Archaeology that opened my eyes to Irish history. The museum is full of old findings from prehistoric and Viking times and from medieval Ireland and some of these findings are from places where I have been to in this country so I know where they come from. That’s imposing, thousands of years old pottery and jewellery from the Irish countryside! Did you know Dublin has more waterways than the Liffey? There are the canals that were originally built for transport needs. The Grand Canal is the longest of them. It makes a 6 km loop around Dublin city centre. There is no traffic more, just occasional house boats. And you can see more Dublin doors behind the canal. I would like to walk the whole loop but didn’t have time with that. But you can do it if you like. 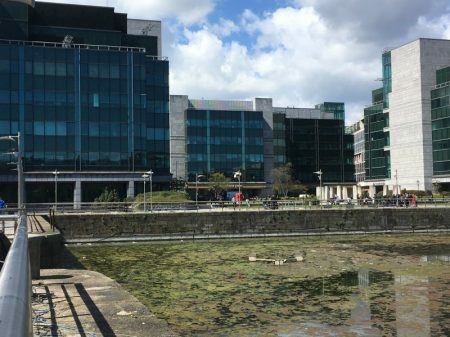 So my self-guided Dublin walking tour only covers a part of the Grand Canal. We are walking along the canal from the old Georgian part of Dublin to its modern part, the Docklands. It’s quite a difference if you can walk along a waterway compared to ordinary streets. You hear the birds and sit down for a while like my husband Clas did while I took photos on Dublin doors. There was someone else too, the Irish sculptor Rowan Gillespie. This is the Grand Canal Docklands a bit north, a new built area where red sticks are used as a decoration. That reminds me of boating on the lake which is my summer hobby. The Docklands has mainly office buildings but there are hotels and culture venues as well. This (below) is Bord Gais Energy Theatre, also called Grand Canal Theatre, on a huge square built in 2007. It certainly brings a lot of energy to the docklands. The Grand Canal waterway takes you back to the Liffey that you can cross along s a modern bridge, Samuel Beckett bridge that looks like a harp. Beckett was a writer and a Nobel Prize winner and a Trinity College student. The harp bridge was designed by a Spanish architect inspired by Irish music. One of the new buildings across the bridge looks like a Guinness glass. But Guinness that is a Dublin sight too, is in west. This is a new landmark in Dublin, the Convention Centre Dublin. An American-Irish architect designed it and building it took a long time. The CCD opened for international business visitors in 2010. The Convention Centre Dublin says it can take up to 8000 conference guests and there are 22 meeting rooms. The Guinness glass hides a large atrium that has curved walls and many escalators. A great example of what modern architecture can do! I came here many times since Clas was working here the whole weekk. The CCD represents modern Ireland and nearby there is something that takes you back to the old days. The Jeanie Johnston Tallship shows us the hard times Ireland has had. The Jeanie Johnston is a museum ship that shows how Irish emigrants left their homes when they were starving during the Great Famine and had to take the weeks long trip on rocky ocean waves and begin a new live in the New World. The Great Famine lasted for years around 1850 and changed Ireland quite a bit. One million people died from the lack of food and one and a half million left the country, most of them with ships similar to the Jeannie Johnston. These quayside statues by the Dublin sculptor Rowan Gillespie bring back the Great Famine. They touch so much. The sculptor himself sits on a bench by the Grand Canal. Maybe you walked by him? The quays are a wonderful area to walk along and there are good places to sit down. It’s mostly a modern area, office blocks and so, but old harbour equipment has been saved as well. And there are many bridges across the Liffey for cars, walkers and trains. I said in the beginning that 10 million people have left Ireland and told that one and a half million left in the Famine years. When did all the others leave? You will get to know that in this glass building. It is the Irish Emigration Museum EPIC. The museum shows Irish history in a modern, interactive way. I was planning just to drop in and finally spent hours in the museum listening to Irish stories and learning about Irish culture. The focus of EPIC is yet on when, why and how so many people left Ireland, where they went and what they did in their new home country. Very fascinating stories and a very nice way to show it all. The museum has got a lot of praise and I agree. If you can go and see EPIC. Walking north of the Liffey there is this large building. It is called Custom House but it is a government office. The Irish built this huge custom house but after a while custom business moved to London. Neither is a custom house needed in today’s EU. These photos show O’Connell Street that is the main street between north and south in Dublin. There is the Old Post Office, in fact it’s only the facade of it. The rest was destroyed in an uprising in 1916 that finally led to Irish independence. This is the Spire. Its real name is the Monument of Light. It is 120 m high and made of stainless steel. It’s three metres wide in the beginning and 10 cm wide at the top. Ha’penny bridge is what most people think about when they hear the word Dublin and you can see the bridge here. The bridge links Temple Bar to the north and 30 000 people cross the bridge each day. There is no fee but there used to be. That’s what the name comes from. For over a hundred years they took a fee for crossing the bridge, a half penny. The half penny bridge was made by an English iron worker in 1816. He made the bridge of cast iron and painted it white. He designed nice gates and on the top he put iron lanterns. Ha’penny bridge, the symbol of Dublin. Ha’penny Bridge takes you back to Temple Bar and beyond it, to the old part of Dublin. There is the Dublin Castle. Dublin Castle is located in the place Dublin got its name from. There was a dark pool (Dub Linn) that later on got covered. You don’t see much about the old centre of Dublin. But Dublin Castle is left, rebuilt over centuries and added to. Originally built in 1204 by King John of England the castle was the headquarters of the English that ruled Ireland for the next 750 years. Since Ireland got independent in 1922 Dublin Castle is the place for Ireland’s big state events. The present Georgian palace was added in the 18th century and there are the castle’s state apartments that you can visit. The state apartments consist of dining and drawing rooms and a throne room. All rooms are very decorative. This is St Patrick’s Hall that used to be the castle’s ballroom. Today it is the most important ceremonial room in Ireland. It is a hall with beautiful ceiling paintings and many banners on sides. They are banners of the knights of St Patrick. Christ Church Cathedral is close to Dublin Castle and it is Dublin’s oldest building. A Norse king and an Irish bishop built the cathedral in 1038 after the Normans took over the city. Christ Church Cathedral has changed its form since but there is an old leaning wall inside and other old parts remain. And you have to see the interior decoration. You can also see that if you go on a concert in the church. If you followed my Dublin walking tour you have been walking 8 km in a day which is quite a bit. You deserve a beer in Temple Bar, and Irish live music. Hoping to meet you one day in Dublin and have a great evening! Trinity College has admitted Catholics since the 1870s. It was the Catholic Church itself that forbade it’s members from attending without specific permission until 1970. Thank you for your lovely walking tour and for your information and photos of Giant’s Causeway. We are planning a trip in the near future to Ireland and your site has been very helpful. We can’t wait! So glad to hear you find my site helpful. I also recommend you go and see Wicklow mountains, I went there too but didn’t write about it yet. You can rent a car or take a bus tour. This was very helpful! Thank you! We are visiting in May and spending 2 nights in Dublin. How is parking around town? We plan on staying in outer Dublin as the hotel prices are cheaper, but want to go into the city. I’m sure you will have great days in Dublin, May is a wonderful time to visit! But I have to say I don’t know about parking. We only rented a car to make a day trip to Glendalough and Wicklow mountains so I don’t have any experience in parking in the city.